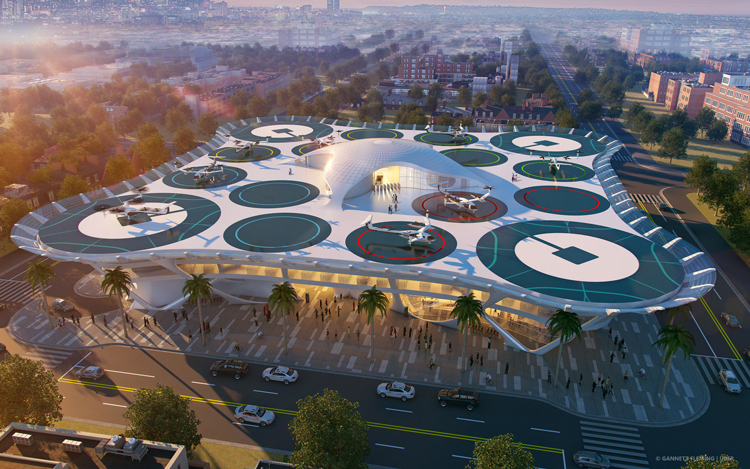 Los Angeles — Gannett Fleming earned a coveted spot among the top finalists in the Uber Elevate Skyport Challenge and unveiled its concept at the Second Annual Uber Elevate Summit on May 9 in Los Angeles. Has a through-put capacity of 52 eVTOLS per hour, which is enhanced by a wire guided robot that captures the front landing gear of the eVTOL, lifts the gear inches off the tarmac, and rotates the vehicle 180 degrees to position it to taxi for immediate take-off. The PAW and SKYPORT designs offer practical solutions to make our communities more livable, workable, accessible, and sustainable. “This is the culmination of hundreds of designers and engineers who have created dozens of designs for a highly efficient and modular Skyport. While uberAIR might feel like a faraway dream, it’s closer than you think, and urban infrastructure has to start to evolve now to keep up. We’re excited to have collaborated with leading firms to imagine how physical Skyports would work at scale and how we can best design spaces that are quiet, environmentally conscious and create natural pockets of activity for the transportation of the future,” said John Badalamenti, Uber’s head of design for Advanced Programs and Aviation.